This USB C Hub adapter is equipped to charge your USB C laptop quickly at a max of 20V/3A while simultaneously serving as a power supply for other USB-C devices (fast charging) based on PD charging protocol. Experience an exciting convenience while maintaining a stable connection to all devices. HDMI Port x1：4K HDMI adapter mirrors your laptop display to HDMI-enabled device with the resolution up to 4K@30Hz(3840×2160). The Ethernet portx1：offers full 1Gbps super fast gigabit Ethernet performance over the RJ45 Ethernet port, faster and more reliable than most wireless connections. 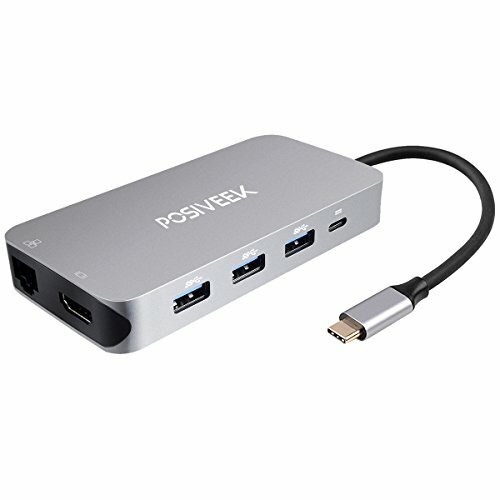 USB C PD Charging Port x1：USB C power delivery port charges your MacBook Pro or other Type C devices while connecting multiple peripherals or transferring data. 9 in 1 USB C Hub Adapter: Simply expands one of your computer's USB C port to a Type C PD Charging Port, a 4K HDMI Output, a Ethernet port, 4×USB 3.0 Ports, a SD and a micro SD card slot and a charging port. The type c hub for almost all possibilities and accessories and avoid the equipment constantly switching, making your desktop clean and organized. Hub USB C HDMI Output port：mirror or extend your screen with the USB HUB HDMI port, directly stream 4K×2K @ 30Hz refresh rate to Ultra High Definition TV, monitor display or projector. Very clear, provide a extraordinary sight experience. Ultra fast transmission：The Ethernet port provide a stable ,reliable Web access of up to 1 Gbps; USB 3.0 ports/SD/Micro SD data transfer rates up to 5Gbps(current output can be up to 4.5W), you can transfer everything from a TF/SD card to your MacBook shortly(Included upload and download photos, videos, music and other files). The USB C Hub with USB C PD charging port can applies to 20V@3A, 60W and 87W power adapter, it can charge only. 18-Month Warranty: About this USB Hub adapter, Posiveek stands behind the quality of everything we sell, we would definitely address our customer queries and find alternatives to make sure that your issues stands resolved. If you have any questions about this product by Posiveek, contact us by completing and submitting the form below. If you are looking for a specif part number, please include it with your message.